Physical Education instruction focuses on the development of individual skills as well as understanding teamwork and good sportsmanship. We direct students to allow God to be Lord over our whole spirit, mind and body. Boys and girls in first through eighth grades receive twice-weekly instruction from skilled PE instructors in units such as soccer, basketball, lacrosse, gymnastics, track and field, as well as physical fitness. 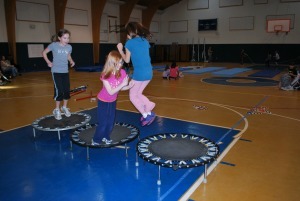 Each year students show their gymnastic talents at the Gym Show, participate in a Sports Day of track and field events, and test for the Presidential Fitness Award. PE is offered to Kindergarten students once a week. Boys and girls in fourth through eighth grades can participate in an after-school intramural indoor soccer program. Middle School students can try out for girls volleyball and boys soccer teams in the Fall. Boys and girls basketball and cheerleading teams are formed in the Winter. These teams compete with other Christian schools in the Baltimore area.